Connexion has been alerted to email scams involving supposed ‘reimbursements’ from the tax office – under no circumstances should you click on any links in emails like this. One reader has forwarded the email shown in the image above – it appears to come via the official tax office website and refers to a ‘notification of reimbursement’ for €143.92 asking that the recipient click to ‘access the reimbursement form’. It says that if you do not do so quickly your reimbursement will be delayed. 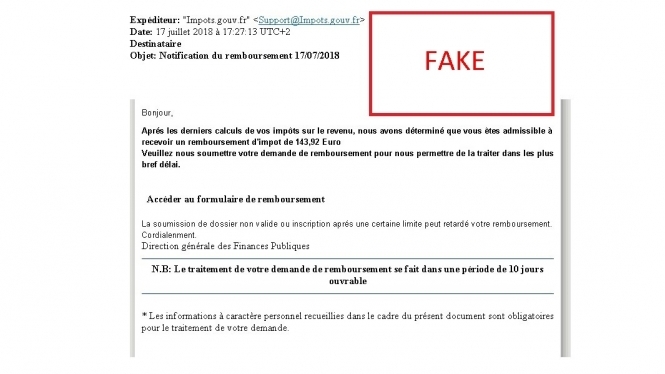 The email does not look fake at first glance, but it contains spelling mistakes, one likely indicator that a supposedly official email is not what it appears to be. It is likely that if you did click on it you would be invited to enter bank or credit card details – however the tax office has confirmed to us that they never send emails asking people to click on a link to be reimbursed or asking you to submit a bank card or other personal details for a refund (equally do not give these to anyone who telephones you if you are not completely sure of their identity). If a reimbursement is really due to you the tax office will write a letter to you notifying you of it and they will refund you with a cheque or a bank transfer without you having to do anything to obtain or 'apply for' the refund. If in doubt delete suspicious messages; you may also seek advice from your tax office or from the general tax helpline 0 810 467 687.